The great work of constructing a raised roadway across the wide hollow between Holborn-hill and Skinner-street is at last making some progress. Within the inclosed space where the foundations of the masonry are being laid the workmen are constantly busied in erecting the scaffolding which will facilitate the placing of the massive blocks of stone, and in other operations subservient to the building of the viaduct. 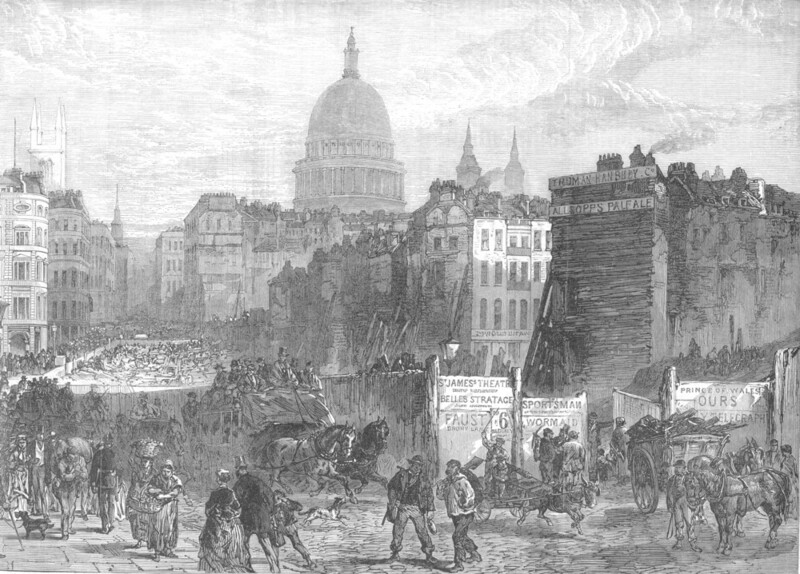 The Illustration on our next page is taken from Holborn-hill, near the end of Shoe-lane. It looks down into the bottom, to the right of which is Farringdon-street, but concealed by the houses at the corner and by the lofty barricades; to the left is the end of Victoria-street; and, beyond, in the distance, the ascent of Snow-hill and Skinner-street, with St. Sepulchre's Church on the one hand, and St. Paul's dome on the other.